Anyone employed on a ship is considered a seafarer, whether that be a croupier on a cruise ship, an Able Seaman on a container ship or a captain on an oil tanker; they are all known as 'seafarers'. As someone who has spent my adult life fighting for these workers’ rights and industrial standards, I wanted to come up with another angle to support them. I decided to combine my passion for swimming with highlighting the hardship of life at sea and the plight of seafarers, the forgotten workforce hidden from the eyes of the world. The vast ocean is quite invisible to most of us, and few realise that 90% of everything we use comes to us with the help of over a million seafarers working around the globe and around the clock. Being a seafarer is 17 more times more dangerous than mining. Added to that, it is estimated that some 600,000 seafarers are currently experiencing some form of exploitation. Isolation, loneliness, and the high incidence of exploitation are partly responsible for many seafarers suffering mental health and substance abuse issues. I am encouraged by how my swim achievements, fund raising and personal commitment have opened discussion of these issues and respect from the broad maritime community. My key objective is to continue to build on a worldwide program which seeks to deliver immediate and high quality mental health referral services to any seafarer regardless of nationality, age, gender or geographic location. 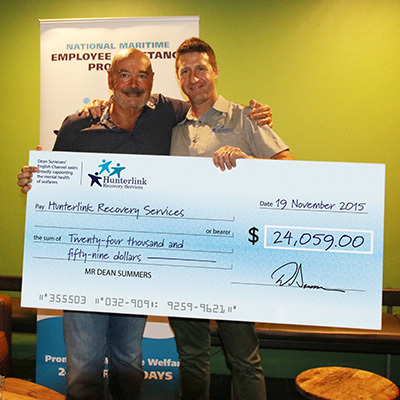 Hunterlink is a Newcastle based organisation who have rolled out a national program to do just this. Its plans are now to make this a global effort funded by unions and industry to benefit all seafarers at no cost. In the preamble to the Maritime Labour Convention which for the first time in history deals with the human element of shipping, the ILO state 'Considering that, given the global nature of the shipping industry, seafarers need special protection'. There can be no more important consideration for the men and women who carry the world’s economy than their health. Mental health remains under-resourced everywhere but I’m confident we can make a difference for seafarers. much needed mental health support via Hunterlink. swims with your friends and family!